I've chosen blues for this month's choice from sponsor Eternal Maker inspired by the hottest fabric range at the moment, Outback Wife. This is a range of cotton barkcloths by Cathi Bessell Browne who you may know from Instagram as Gertrude Made. The stories behind the prints are inspired by women Cathi knows and can be found on her blog- see Elaine's story as an example. The fabric itself is slubby, medium to heavy weight but the weave is quite relaxed so the drape is good. My first thoughts for barkcloth are dresses, skirts and jackets. It's also perfect for bags (tote styles would work well), purses and home decor - curtains, pillows etc. 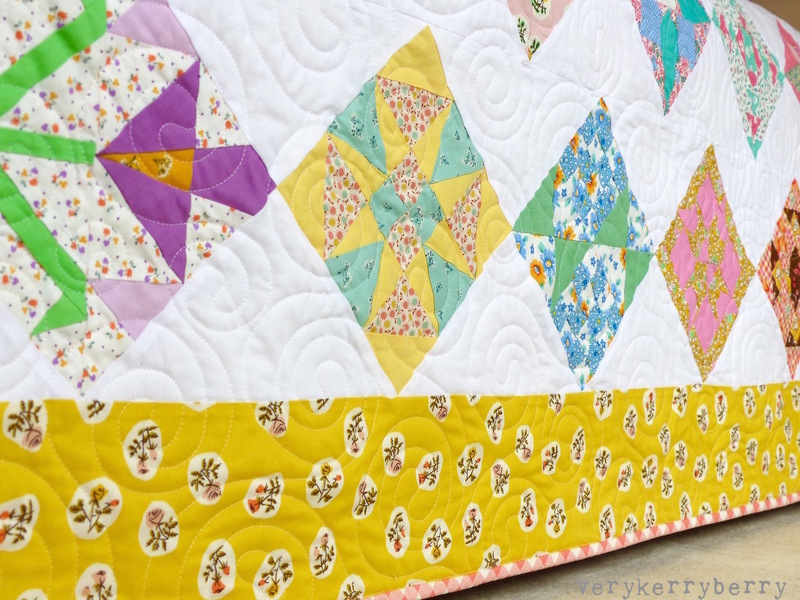 It can work for quilting but it needs simple bold designs and bigger shapes as it is a fabric that frays easily and the seams can be bulky. 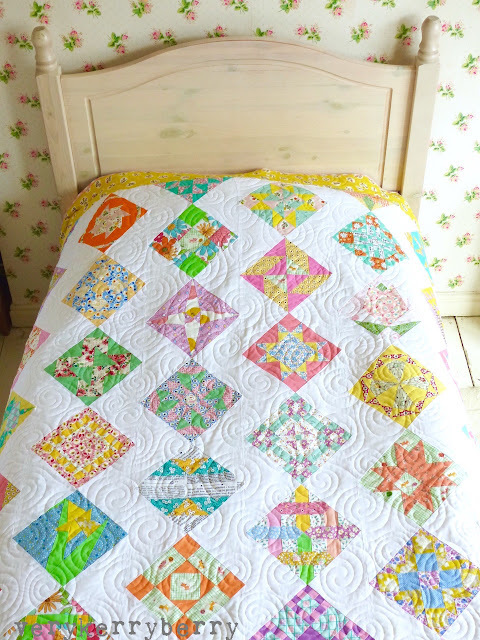 See a stunning of a quilt which mixes Outback Wife with other fabrics here and a free pattern at Ella Blue, the manufacturers of this fabric range. Outback Wife is available for pre-order in lots of colours and it's likely many of the prints will sell out before it arrives in May. 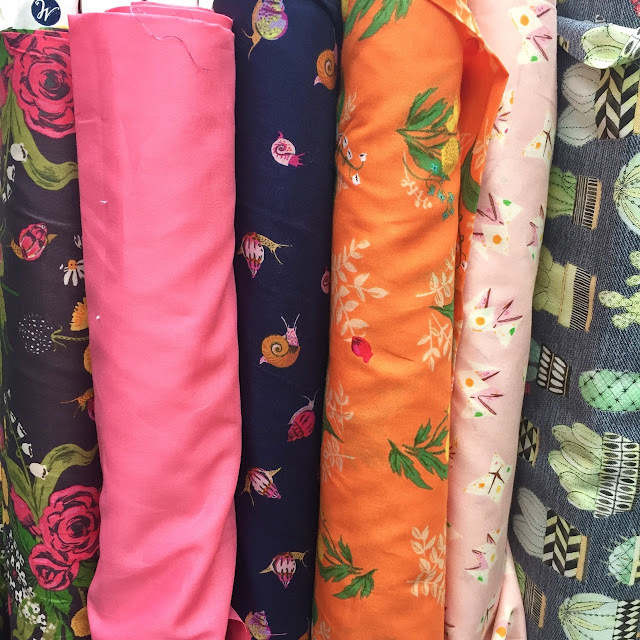 Eternal Maker are stocking the full floral range, Anna spoke to Cathi at the Stitches trade fair last week and couldn't resist all the prints! The range was developed slowly and included handpainting the floral designs so although it is an expensive purchase it's hard to resist at least a small cut and at 150cm wide, that might help soften the blow. 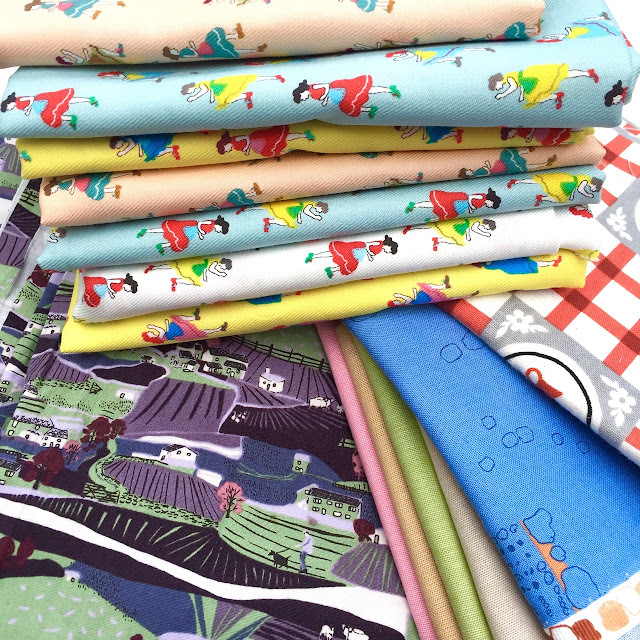 I've chosen some quilting cottons too and some Nani Iro double gauze, so hopefully something for everyone. From main picture (left), then clockwise. Kristen Blue, Outback Wife. Cathi has also designed a pattern for Simplicity including her signature dress style. It hasn't reached the UK yet but I would imagine they are just waiting for the seasons to change. Plumes, turquoise, biology by Sarah Watson for Cloud9 Organics. Quilting cotton. 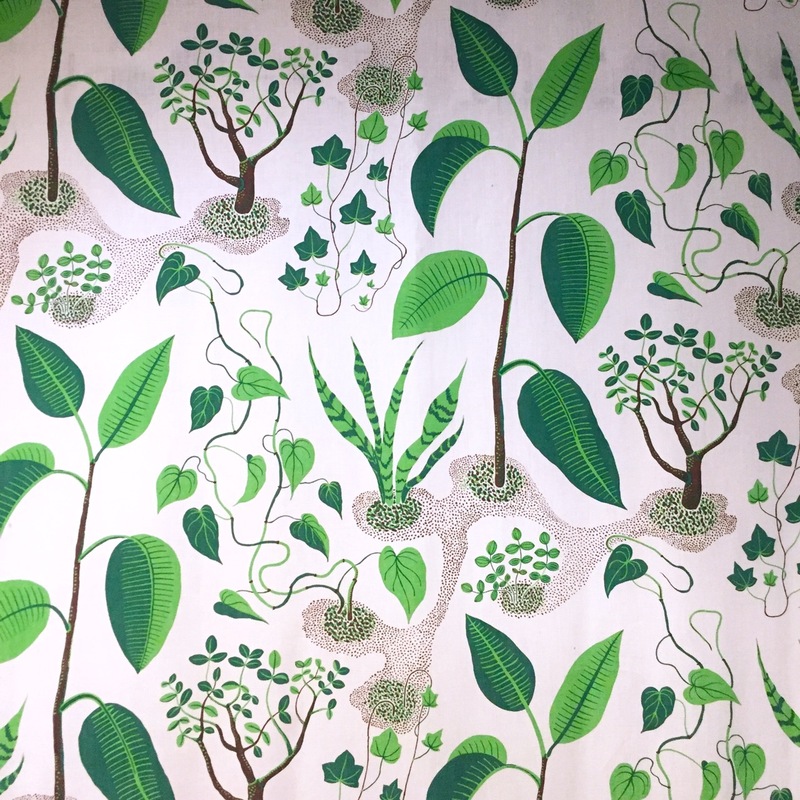 Seedlings in Aqua, Loominous, by Anna Maria Horner for Free Spirit Fabrics, woven yarn dyed cotton. Elaine, Purple, Outback Wife barkcloth. Triangle Blue rayon double gauze, By Naomi Ito for Nani Iro, Kokka. Rayon (lyocell) cotton blend. Last week, I was lucky enough to have a few days away visiting my brother in London and enjoying some of the very fine exhibitions that are currently on. We eventually made it into the Hockney exhibition at Tate Britain- it is very popular and we ended up going early evening as the morning was jam-packed. It's a joyful celebration of of Hockney's paintings, drawings and other media throughout the last 60 years. We also went to the Royal Academy to see Revolution: Russian Art 1917-1932. This is another riot of colour but it's a shocking and powerful collection of art in many forms- painting, pottery, dance, film etc. and makes for rather profound and disturbing viewing, well worth seeing. We spent a very happy morning in The Wallace Collection which is a gem, just off Oxford Street and is a stunning, lavish, historic London town house with an amazing selection of armoury, weaponry, paintings, artefacts, porcelain, furniture and much more. I could spend days in there and it has free entry too. I also visited the Fashion and Textiles Museum, somewhere I also seem to frequent on every London trip. It's a small museum but the exhibitions are always beautifully curated and displayed, and photography is allowed too. 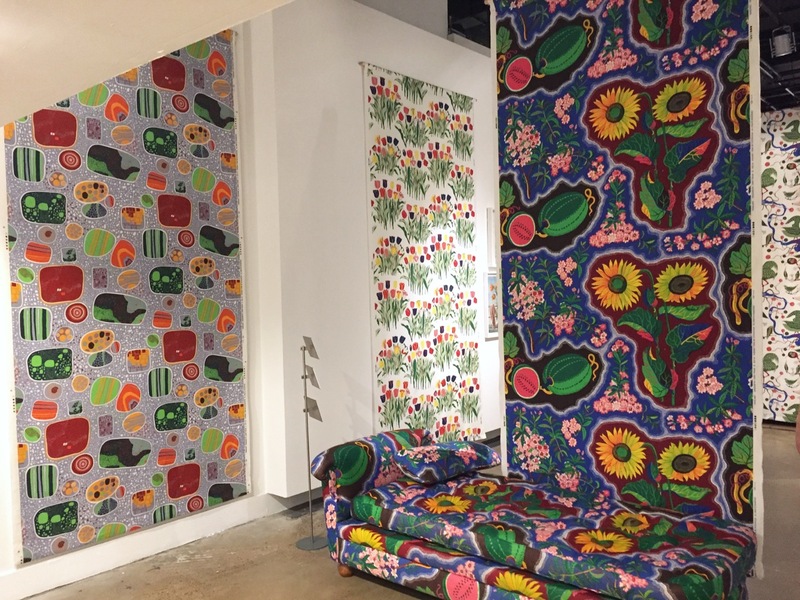 It celebrates the work of Josef Frank, his patterns on fabrics, furniture and paintings. 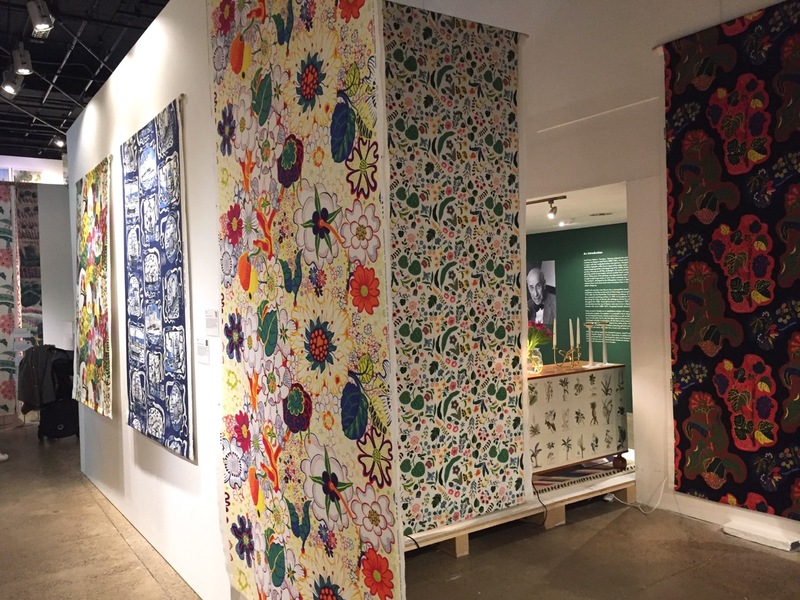 It's also the first every UK exhibition of his textiles and they were the stand out to me. One 'room' shows the effect of Josef Frank textiles and furniture displayed together- he was influenced by William Morris and I could see that in his pattern repeats and use of natural inspiration. I loved how there were long, generous lengths of his fabrics hanging down and also used to upholster his furniture designs. These were for sitting on too and walking round it was lovely to see children as well as adults enjoying the furniture and marvelling at the use of colour. All the ingredients needed for an Italian meal! 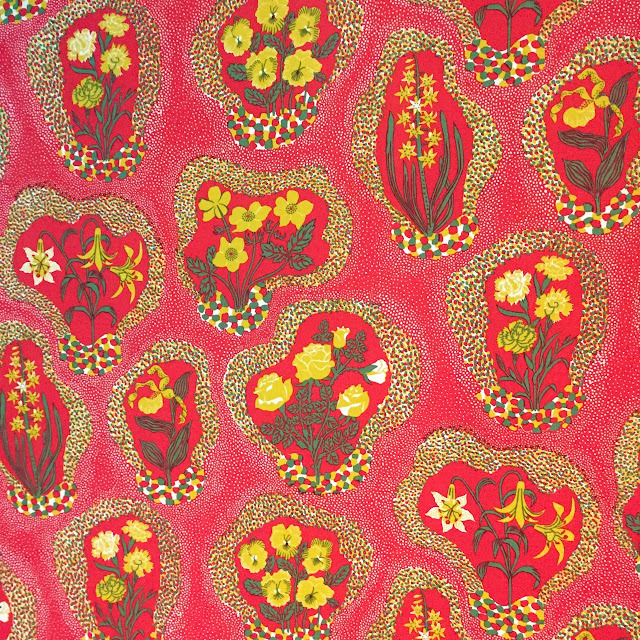 As with many of his prints, although richly colourful, there's only a few separate colours used to create this floral pattern. Very contemporary for the current house plant trend. I think this was my favourite, I just loved the dramatic colour contrasts. 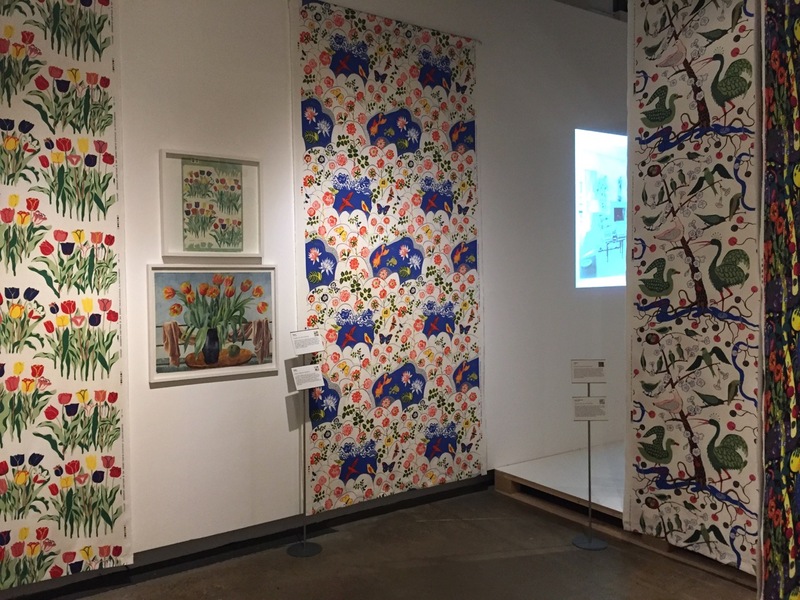 There were a lot of water colours to admire too and visual references to William Morris and other influences. The Fashion and Textile Museum is small in comparison to places like The V&A or the Royal Academy but it's such a comfortable environment to linger and be inspired. 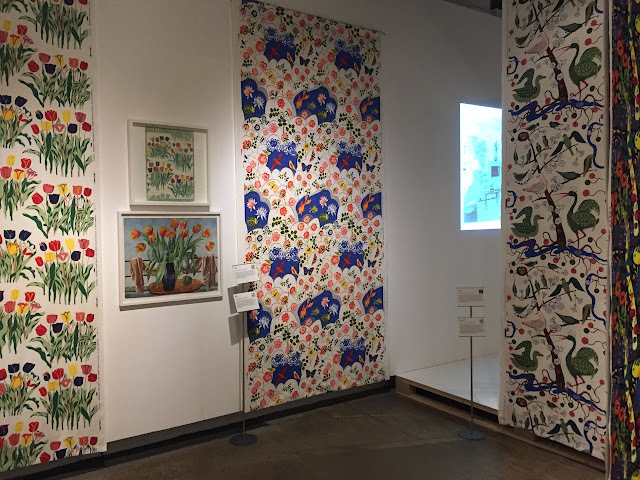 The Josef Frank exhibition runs until 7th May 2017. Another rainy day as I write this in South West UK, so a diversion and a visit to sponsor, Plush Addict who have some colourful deliveries, sunglasses at the ready. 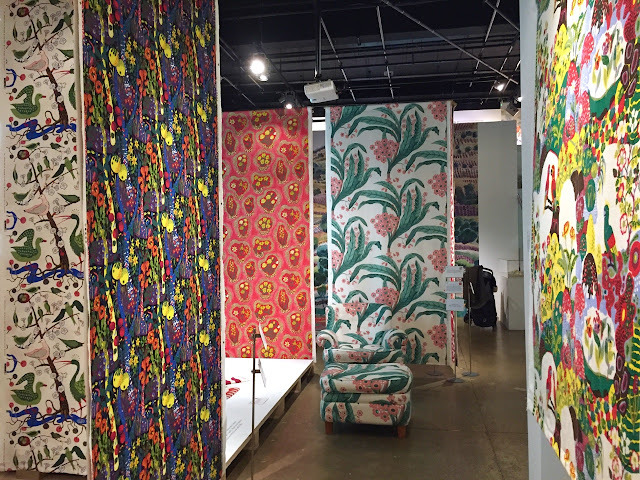 Kona Shade Card printed fabric panel. For those of you who love to colour match, this is a cheaper option than the standard Kona colour card option. 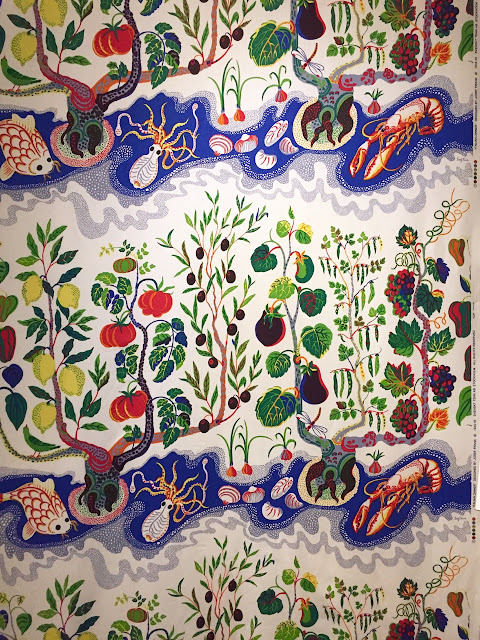 Instead, a printed piece of fabric, 64cm x 110cm, with all 303 colours from the Kona range. I can imagine mounting this on a canvas for a bit of wall art as well as a handy reference! Bargain at £7.50. Cotton Spandex Jersey: Solid Marbled Light Grey. 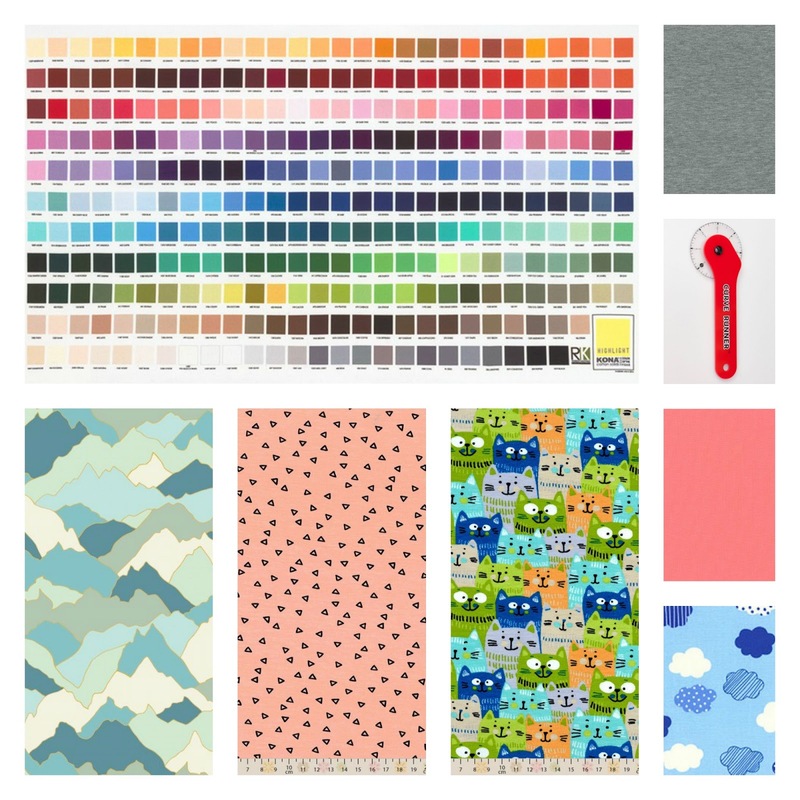 There are lots of new cotton/spandex jersey arrivals in a wide range of colours. This grey is one of my favourite basics. SA Curve Measuring Wheel. Part of a range of measuring wheels in different sizes, metric and imperial and designed to make it easier to measure curves- useful for pattern alterations, e.g measuring the armscye. 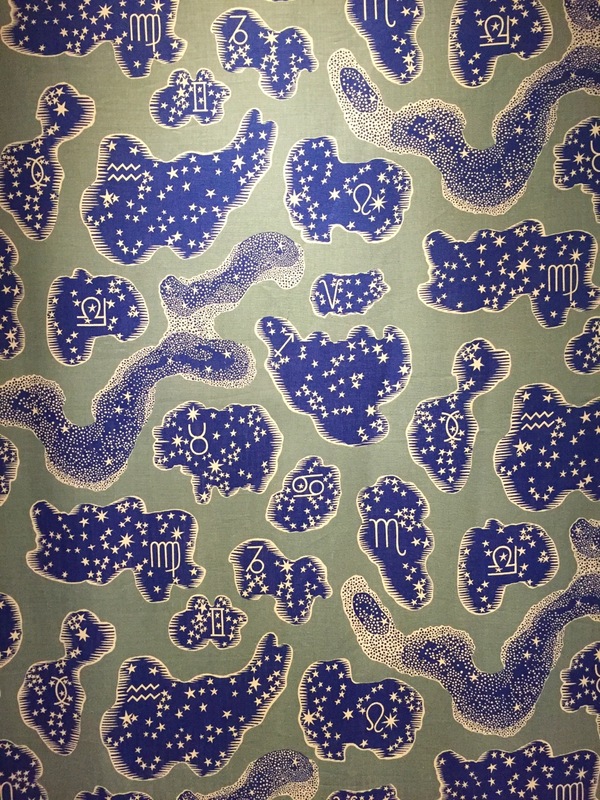 Lecien Color Basic, Clouds Blue- could go nicely with this Lecien Raindrops print. Little Darling Cotton Jersey Contented Cats. I couldn't resist this, perfect for children's wear or keen older cat lovers! 150cm wide 95% cotton, 5% elastane. Little Darling Cotton Jersey Triangles on pink. 150cm wide 95% cotton, 5% elastane. Dashwood Studio Altitude, Mountains. 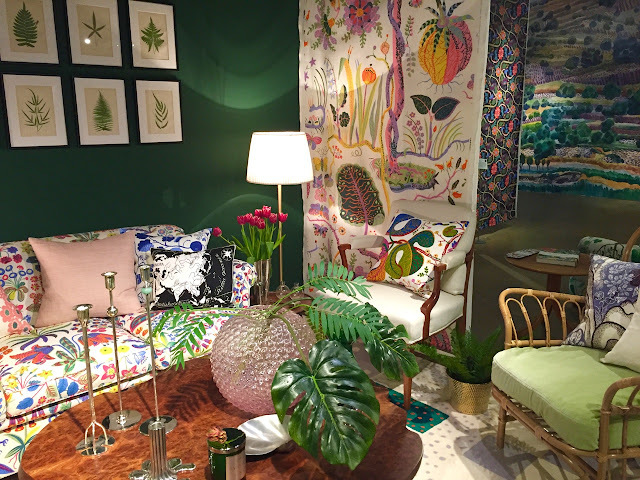 Lovely collection from Pippa Shaw. Sew House 7 Toaster Sweater #1, Named Clothing Helmi Tunic Dress, Sew Over It Molly Top, Megan Nielsen Darling Ranges Dress, Sophie Hines Euler Bralette, Named Clothing shirt dress for Kotiliesi Käsityö magazine, Deer and Doe Melilot blouse. Hallå Patterns Lounge pants , Lotta Jansdotter Everyday Style Esme top. So far, I've made a maxi Darling Ranges dress in a dark chambray, and a Molly Top in Alison Glass jersey, so far so good. Until I attempted the Euler bralette. A simple shape, suitable for a smaller bust and comfort wear. As usual, materials are always a little tricky with any bra making and couldn't source wide plush elastic for the lower band so I went with the pattern alternative suggestion for a fabric band with narrower elastic inside. I'm not sure exactly what drove me a little crazy with this pattern but the band was impossible to turn through without stretching everything beyond what was acceptable and I found the apparently straightforward instructions very difficult to get to grips with. This pattern has been largely used through workshops so maybe that was why it just didn't work for me and it was the final straw with bra making. Sewing bras takes time and concentration. Many sewists who sew the best bras concentrate on lingerie above all other sewing. I don't think I can do that, I want to quilt and dress make so each time I return to bra making, I need to get my thought process and materials ready and find my bra making groove again and it takes time that I don't have. I've had some success with bra making - a couple of Watson's for myself and the daughter, plus Maddie's Simplicity 8229 pattern in workshop and at home but I haven't grown in confidence with fit and construction and I find the process stressful. I don't have to sew everything, so I cut myself some slack and sold my books and supplies. Many of my kits, fabrics and notions were bought at a very low point in my life, a sort of escape with plans of what I would and will make - I'm sure that is a familiar activity to many of you. 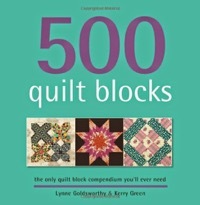 I often do it with quilting and dressmaking but those supplies have more flexibility and are more likely to get used. No regrets and an empty drawer offering storage to all my other projects. I'll continue to struggle to find fit in ready-to-wear but it was just as difficult sewing my own. I've seen many sewists make pretty bras which although beautifully constructed, don't fit. It's a complex business that I'll leave to others! I'll keep sewing knickers, they do work for me, but my dreams of matching sets of nicely fitting undies are on hold, at least for the moment. 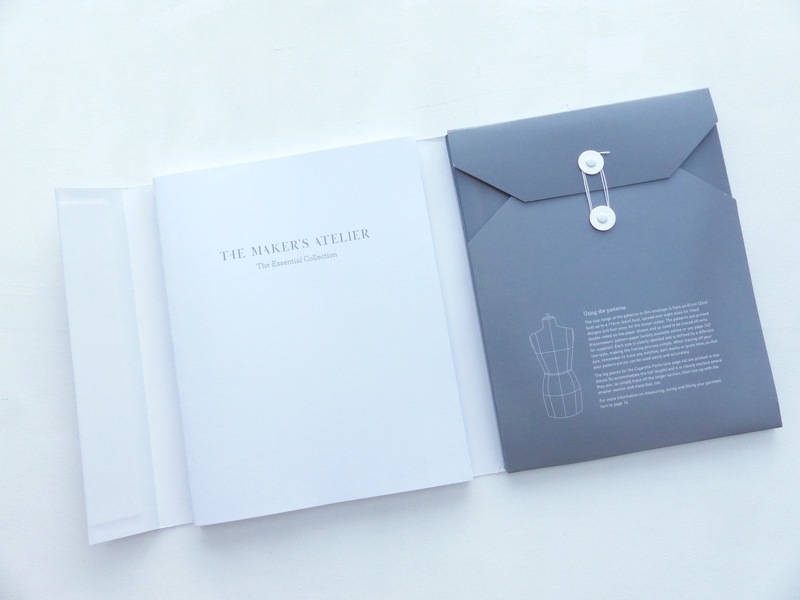 Frances Tobin from The Maker's Atelier has written a dressmaking book and she kindly offered me a copy to review. 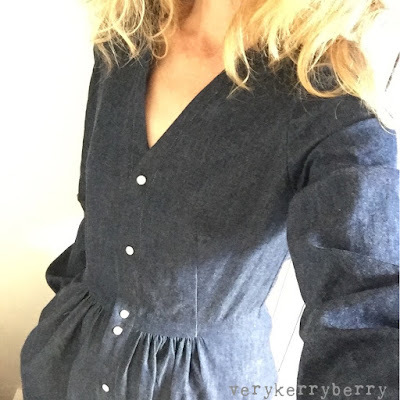 I'd seen the sneaky glimpses inside on her Instagram feed, I like how she's developed her luxe, sportswear style within the busy indie sewing pattern market and so I jumped at the chance. 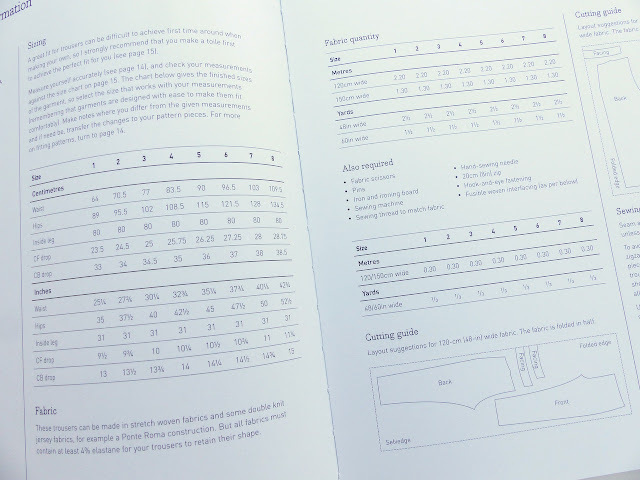 I like to approach dressmaking books primarily as a sewist so first and foremost, I want to know the practicalities of a pattern based book. Is it easy to use? What patterns are inside? What sort of detail does the author go into? The book has a soft cover and is held together with a firm folding magnetic strip which also acts as the book spine: the whole thing opens out like a folder with the book on one side and the patternson the other. 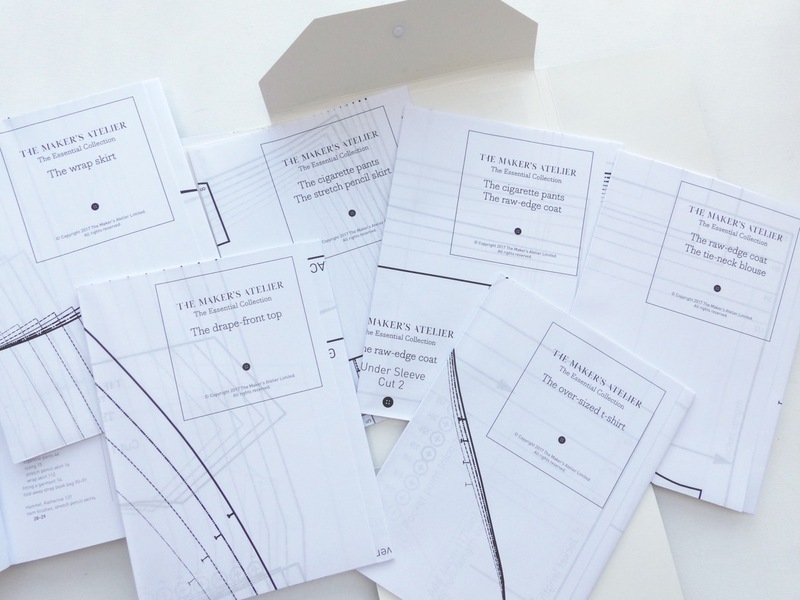 The pattern section is about ½" in depth and the string-tied closure/card envelope matches Frances' Maker's Atelier dressmaking patterns. The best thing is that both sides, the text and the patterns, open out. For the book section in particular, I love this feature, any page will lie completely flat, I wish every sewing book did this! When I first saw this feature, I thought Frances might have self published the book. 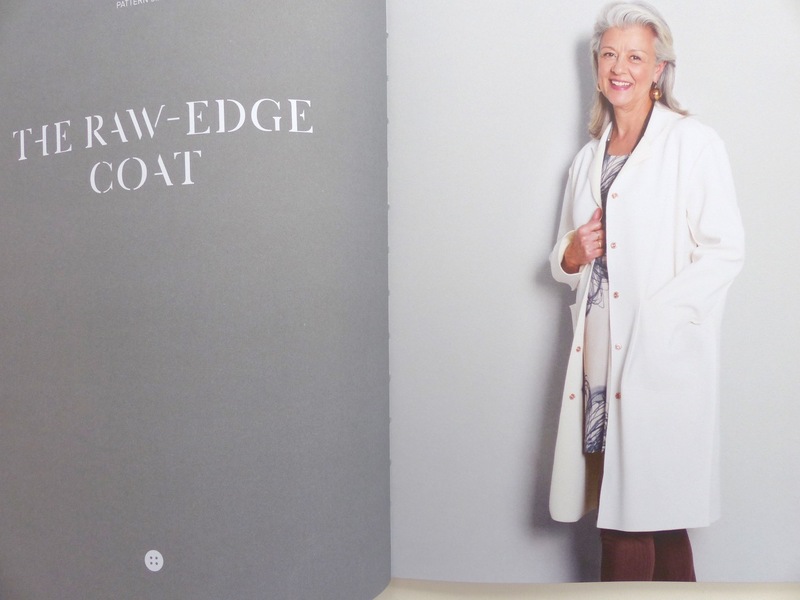 It looked like the sort of styling and practical layout that an experienced dress designer would want, but also something that a publishing house would shy away from as too costly or difficult to manufacture. 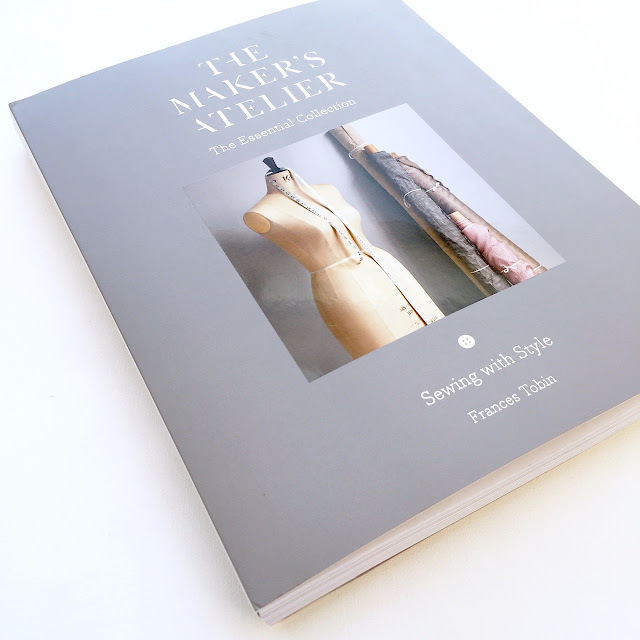 All credit to Quadrille, this book clearly follows Frances' vision and The Maker's Atelier Aesthetic throughout. There are eight designs in total: a stretch pencil skirt, drape-front top, cigarette pants, tie-neck blouse, a book bag, raw edge coat, wrap skirt and an over-sized T-shirt. It's a capsule wardrobe concept with interchangeable separates (three tops, three bottoms), an accessory and an outerwear garment. 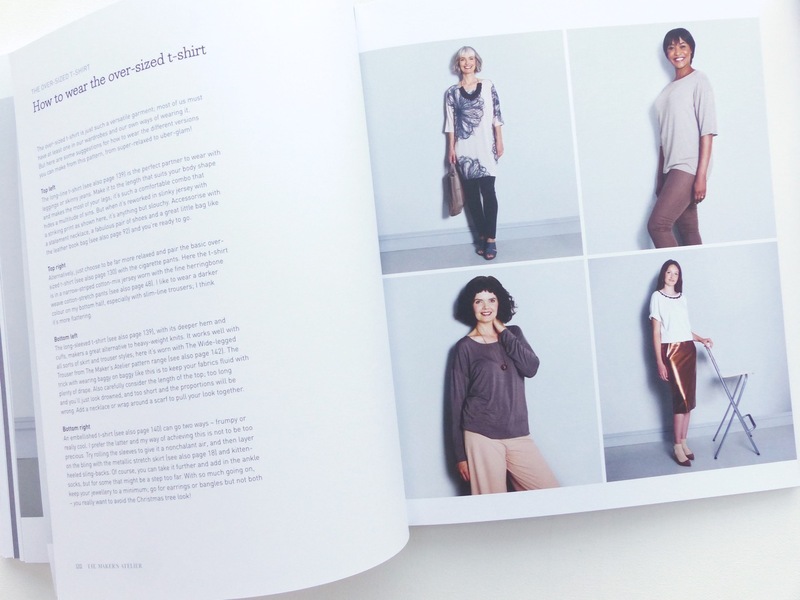 You can see a version of each pattern in the picture below and more variations are included in the book, including lengthening/shortening, new construction elements, different finishes and alternative fabric choices. The tops tend to have a relaxed fit and the bottoms are closer fitting. There's also a mix of woven and knits. 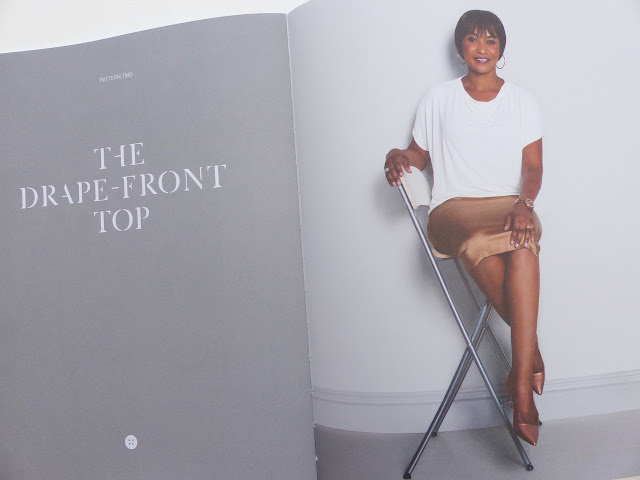 Some garments are designed specifically for knits - the stretch pencil skirt for example, whereas others can be made from either, like the drape-front top. There's a lot of information about more unusual fabrics you may not have used before including thicker, less pliable fabrics like leather, suede, felted fabrics; unusual fabrics like neoprene, stretch PVC, sparkling sequins and coated technical jersey, and luxurious fabrics like scarf silk and satin crepe. The shapes are simple and there are some notable details from France's experience and knowledge working in the fashion industry. Above all, she likes to let the fabrics do the work. There are six, double-sided printed pattern sheets. Some are for a single garment, like the over-sized t -shirt, others have two garments spread across the two sides. They are clearly labelled and the separate size lines are easy to see so although you need to trace, the task is not too onerous. There's lots of information in this book. 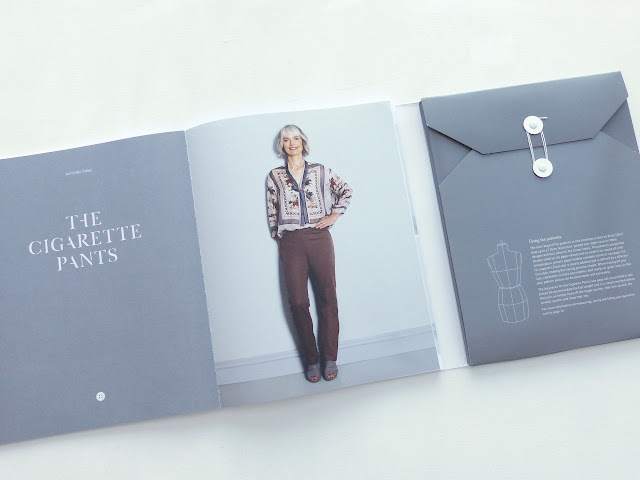 There are two sizing systems- one for the more fitted garments (eight sizes) and another for the looser styles (four sizes which straddle the eight sizes) and finished garment measurements for all styles. 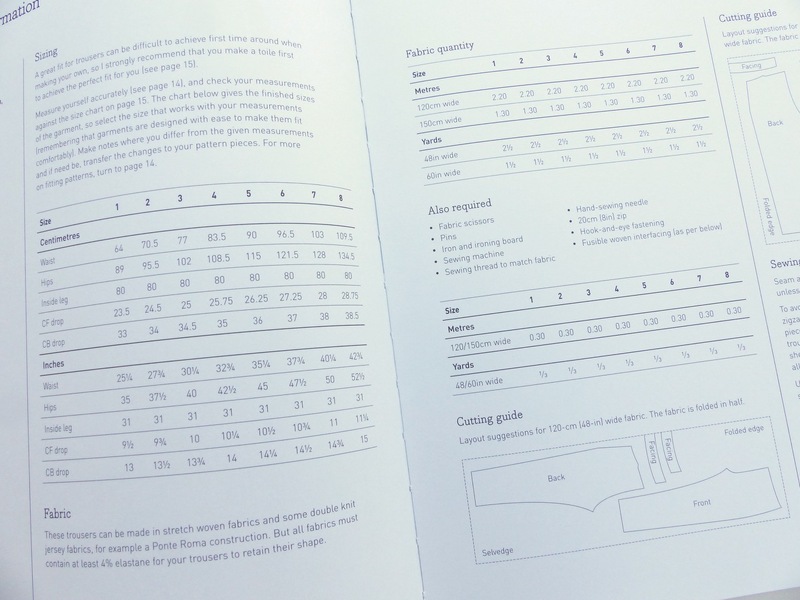 For each pattern, the same format repeats: how the style came about, a technical description of the garment, sizing, fabric quantities, layout/cutting, step-by-step instructions with diagrams, how it can be worn and then suggestions for hacks/variations with more instructions and diagrams. There's no skimping, with lots of detail and information, especially in the variations, and the diagrams and photos are well spaced so it never feels busy. The size range is from 32" - 46" bust. The book's colour palette is a warm mix of caramel tones, neutrals and metallics that are a familiar feature of The Maker's Atelier brand. 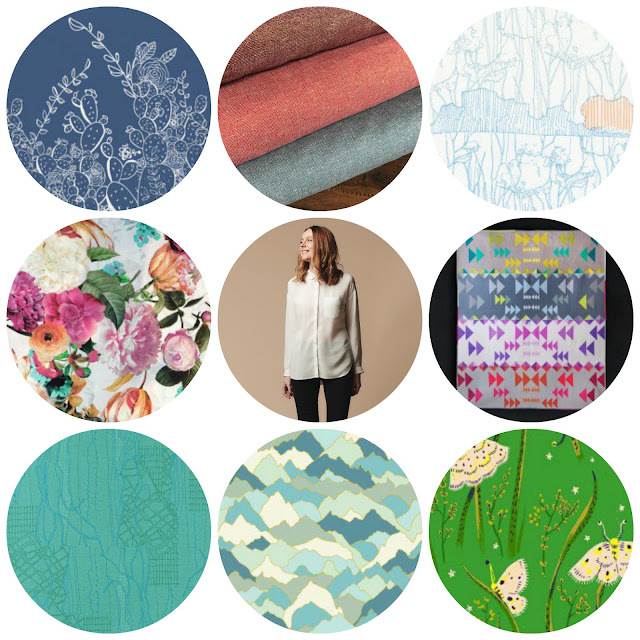 Frances is based in Brighton and sources many fabrics from Dïtto fabrics, well-known for it's designer, quality fabrics. She lists many of her other favourite shops in the back of the book. It's a stylish, classy, clean-cut aesthetic. 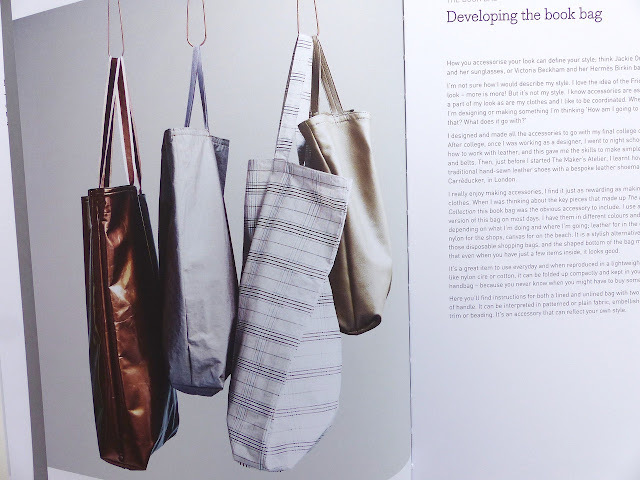 The bag is a simple accessory and although the construction is very basic (no pattern needed, measurements given for various sizes) there are handy tips for using leather, adding a lining and making a fold-away shopper. It's a beautiful book, easy to use and a pleasure to look through. I especially like France's use of metallics - as I go into my later 40s, I appreciate metallics more and more! 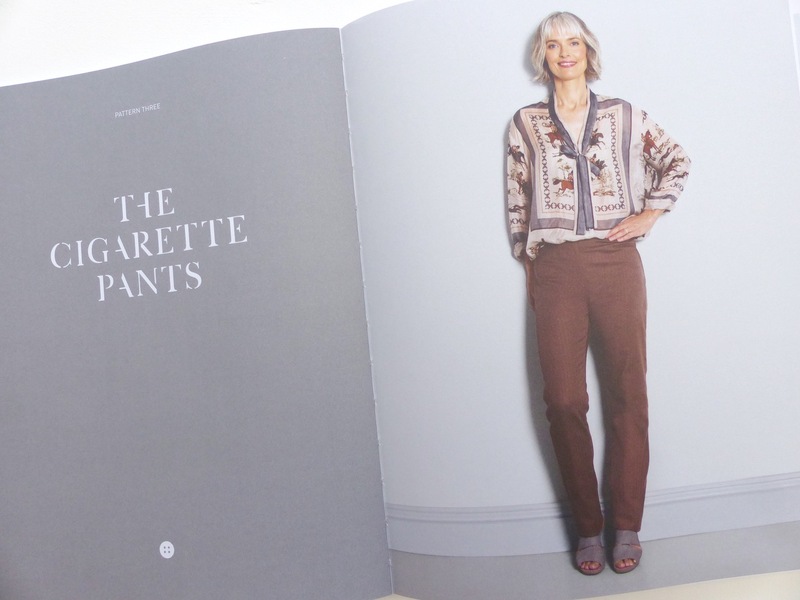 It's a grown-up book, the styles could form part of a work wardrobe, day or evening wear depending on your personal style. I favour the more casual garments as they suit my lifestyle. The skirt silhouettes aren't my usual shape - I like more swish - although I do like the asymmetry of the wrap style. I'll be making the oversized T-shirt first with some draped striped jersey. Do note that seam allowances are usually ⅜"/1cm. 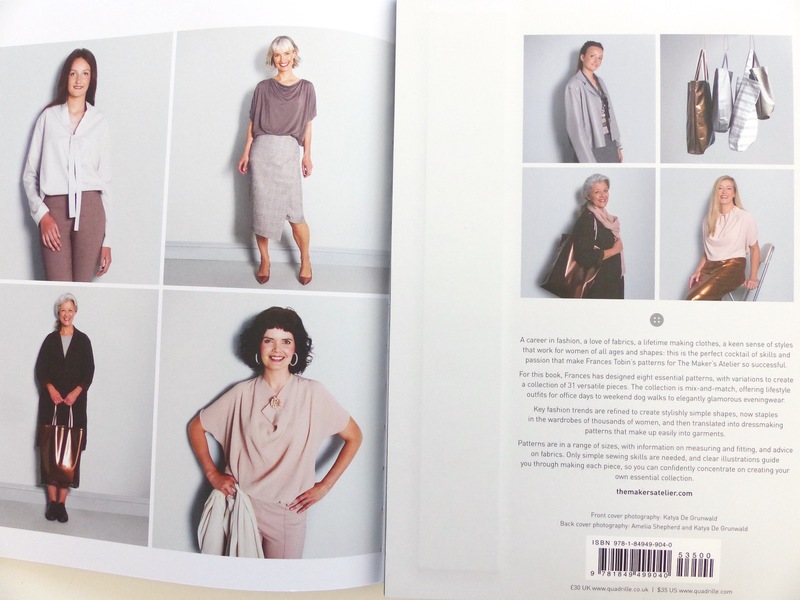 Only one pattern is an existing Maker's Atelier pattern (the stretch pencil skirt) so the book offers good value, especially compared to individual patterns. 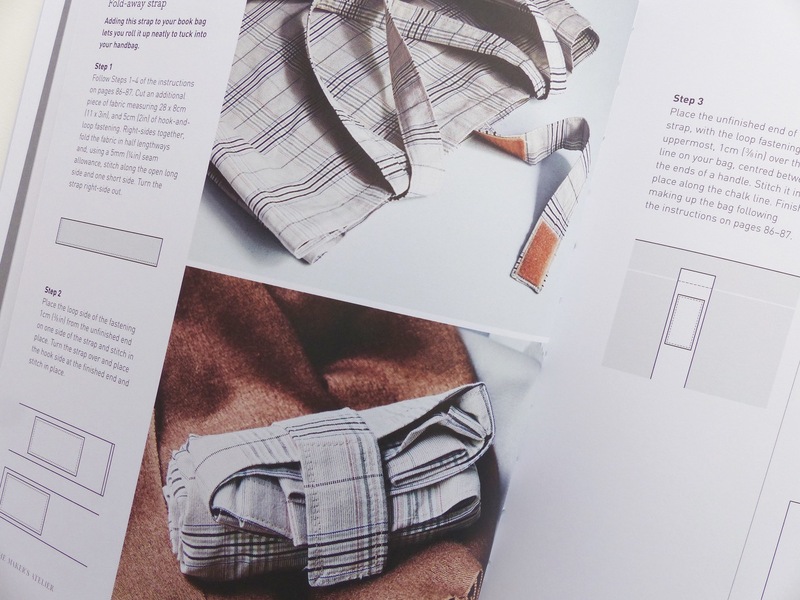 There's plenty of guidance: the fabric details and advice in particular make it much easier to recreate a garment as it appears in the book. The shapes are simple enough to appeal to beginners, and the more advanced fabric options appeal to the more experienced dressmaker. Frances is a straight talker and writes well, there's lots of advice and tips throughout and she keep styles and construction as simple as possible- less is more! The photography deserves a special mention, credits to Amelia Shepherd and Katya De Grunwald. You can find The Essential Collection via Quadrille and The Maker's Atelier as well as the usual online and bricks and as ever my own. Exciting times at Village Haberdashery, the shop move has happened and the new shop is looking amazing! 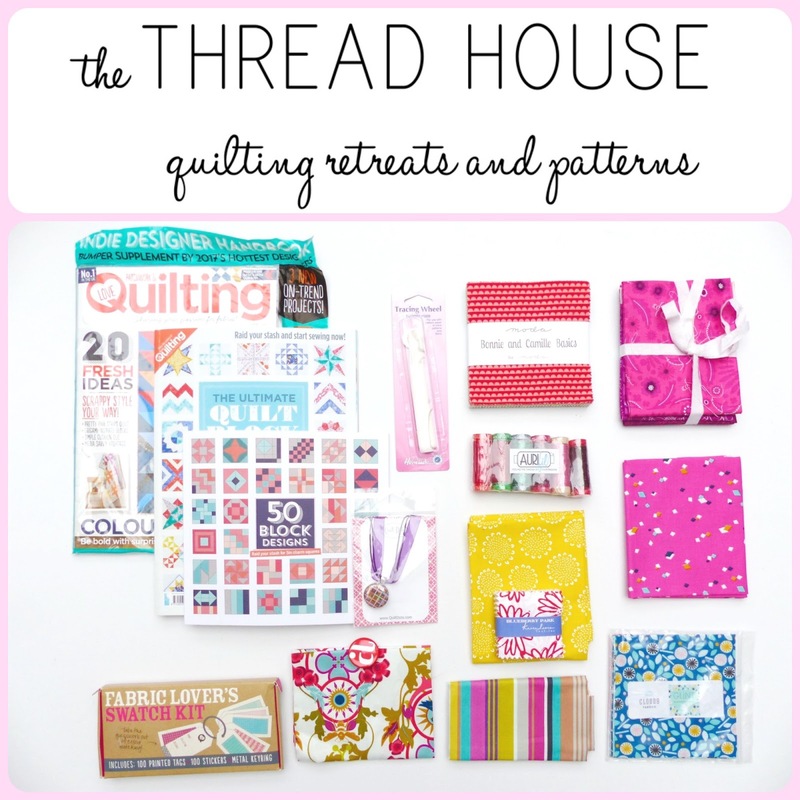 It's a crafter's paradise with room for yarn, paper, stamps, embroidery supplies as well as fabric and patterns plus workshop space for classes or even to hire by the hour. Quite the change from the original shop which was always packed with goodies but a little tight for space. As usual, there's plenty of new arrivals too. Here's my nine picks for February's sponsor post. Art Gallery: Prickly Pear in Indigo from Sage Bari J. Beautiful border print (also available in a plummy Ruby colour). Border printed along one selvedge, perfect for the simplest of dresses and skirts, plus you can see examples of clothing, bags and cushions to see the border displayed on the link. Robert Kaufman Essex linen metallics in new shades, Copper, Dusty Rose and Water. Robert Kaufman:Tree Stripe Border from Friedlander by Carolyn Friedlander. Possibly her best collection yet with trees at the heart of her design inspiration. Quilting cotton. Cotton Lawn Amaryllis. Amazing floral print, on trend with the giant blooms and wide at 59". Maybe a good partner for the Melilot shirt? Robert Kaufman: Cattle Print from Friedlander by Carolyn Friedlander. 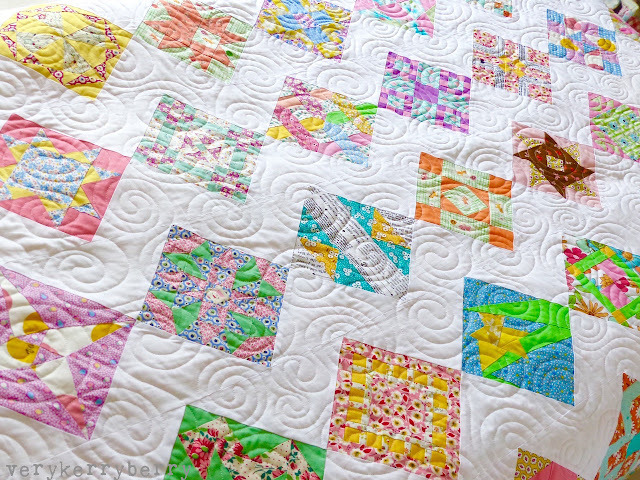 Quilting cotton. 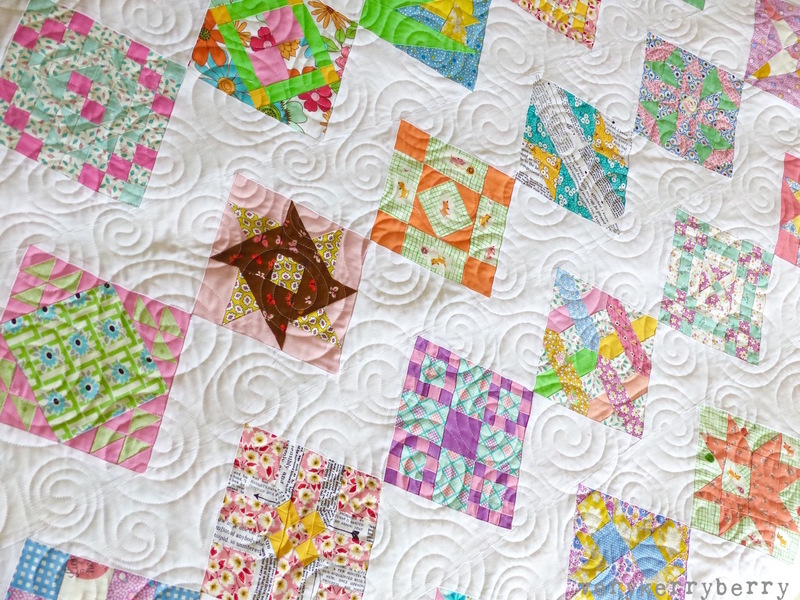 Windham Fabrics: Moths in Jade from Sleeping Porch by Heather Ross. Voile weight collection in jewel-like, saturated colours. 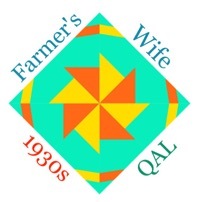 Over a year in the making, a quilt-along and piles of pretty 1930s prints and at last there is a completed Farmer's Wife 1930s quilt. I made a twin size using 84 of the 99 quilt blocks. You can find all the blocks in the quilt-along posts here. Finished size, including border 78" x 95". 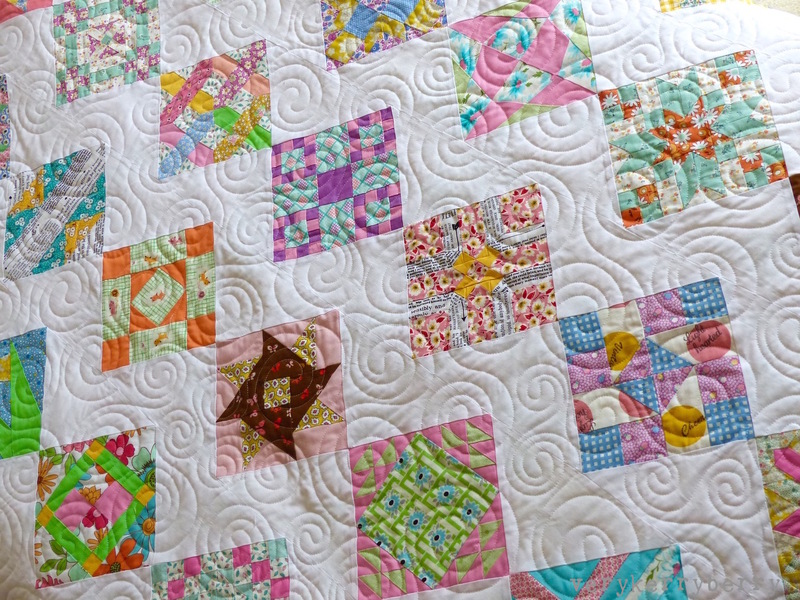 The quilting was beautifully sewn by Trudi Wood of Quilting Prolifically. It's the first time I've used a long arm service and it was a worthwhile investment. 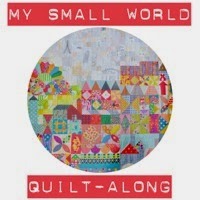 A quilt this size is too much for me to handle on a machine. I followed the layout plans in the book. 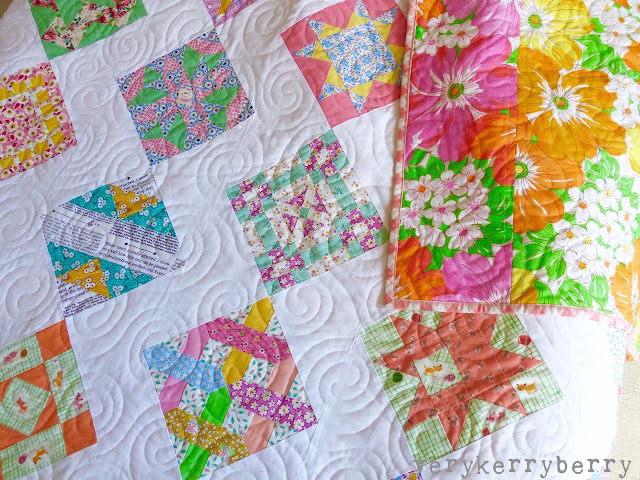 I did need most of the white Kona cotton background for the setting triangles - they took forever to cut and sew to the blocks. 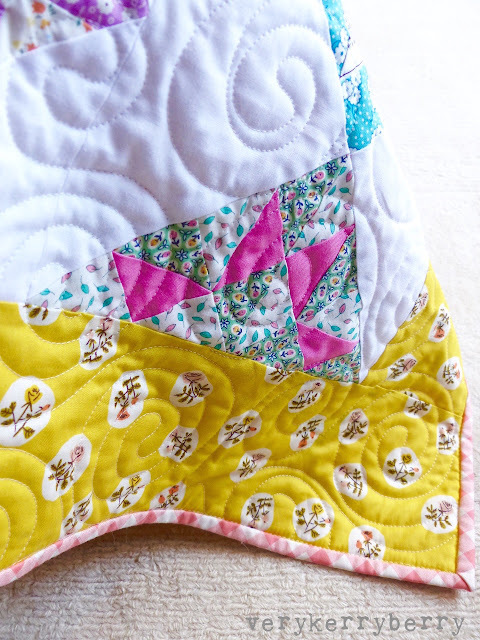 I used the Marti Mitchell Flying Geese ruler which has a line that matches both triangle templates and I also cut my fabric tips down the grain of the fabric, parallel to the selvedges to avoid exposed bias edges. When it came to pressing the blocks and triangles once they were joined together into long strips, I went for a little folded twist between each block. 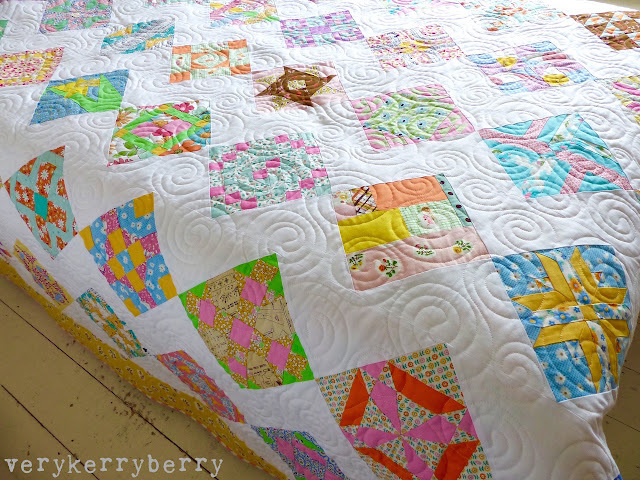 The quilt is backed with a unused vintage cotton sheet which is quite stiff so it gives the quilt extra weight. The large bright florals contrast and compliment the ditsy colourful prints on the front. 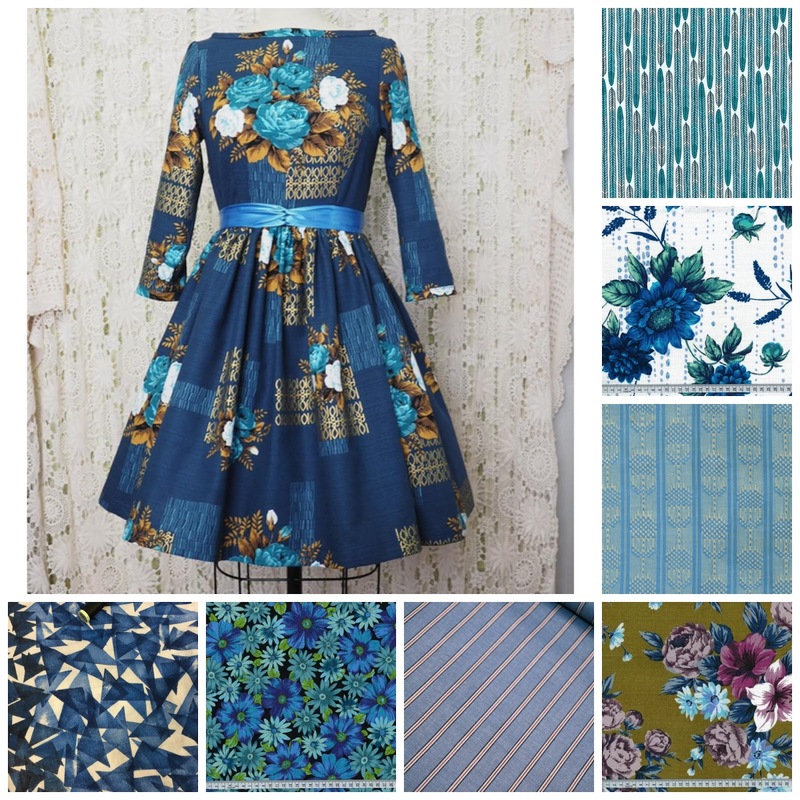 The border is one of my favourite prints from the Heather Ross Tiger Lily prints by Windham fabrics. 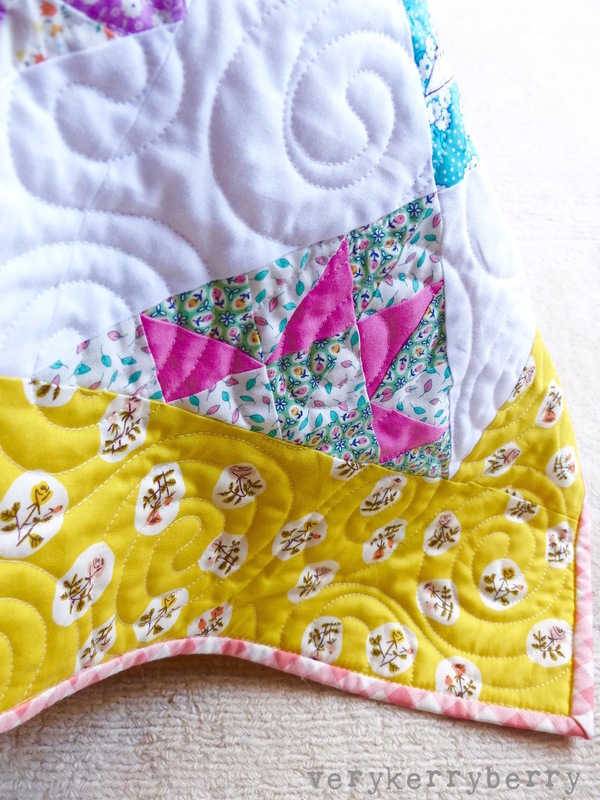 I used many of the Tiger Lily prints in this quilt and yellow was a key colour. The binding is machine sewn for practicality- this is my daughter's quilt so it may well travel with her as she goes on to Uni in a year or so. 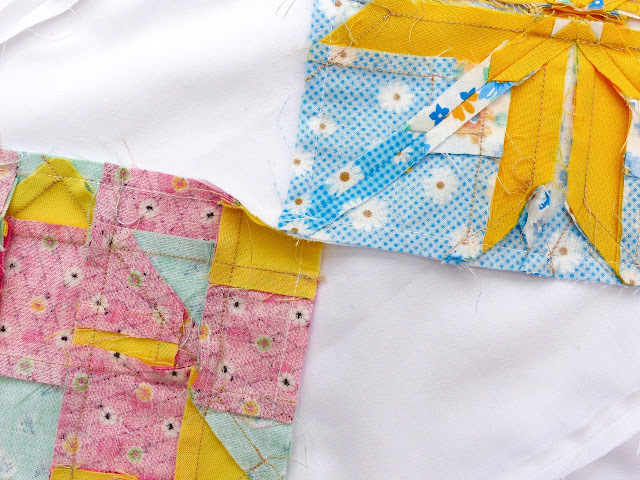 I use Rita Hodge's method for binding. The coral diagonal gingham is by Bonnie and Camille, Vintage Picnic check coral pink. 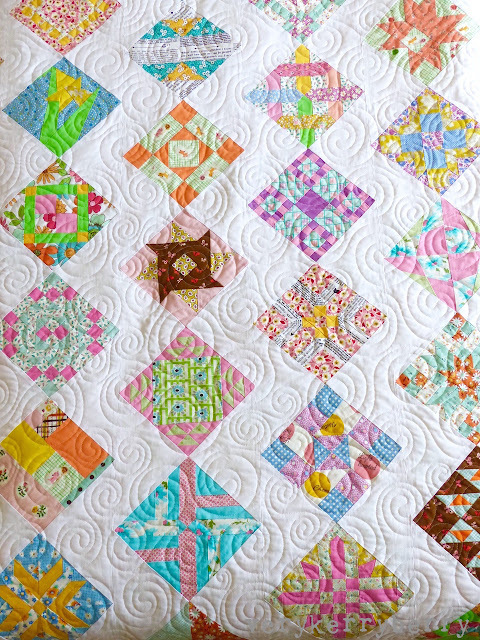 I am incredibly proud of this quilt. Each block was a little composition in colour and a lesson in technique and the quilt-along itself was such a pleasure with the help of all the other block tutorial bloggers and those taking part. Many happy memories and now it's covering my daughter's bed and some of the floor. I've offered to buy her a larger bed but she wants to keep the floor space so it sets amply over a single size. I can't stop looking at it when I'm in her room! 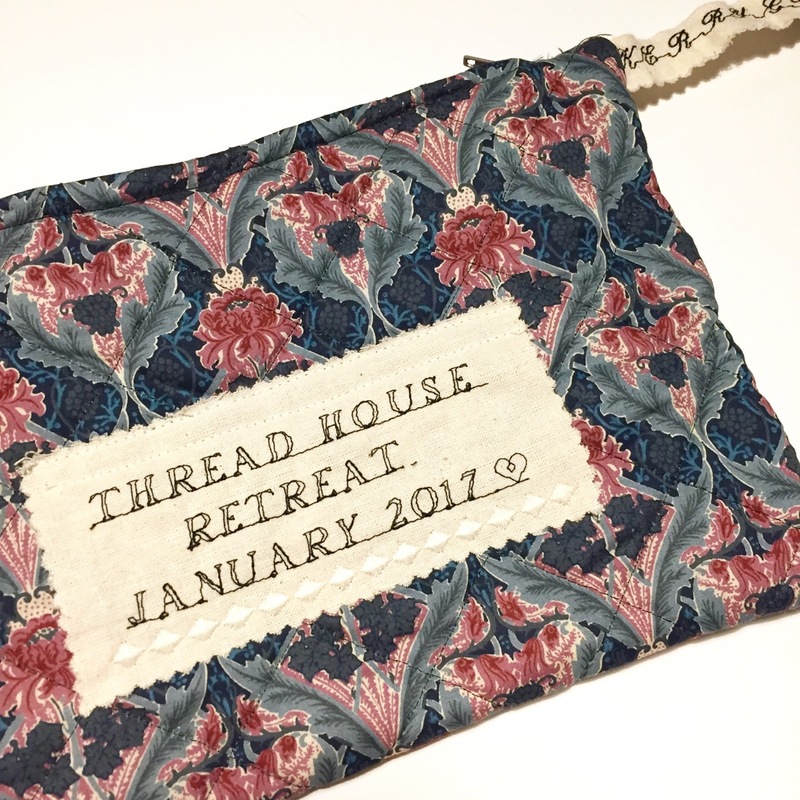 January is such a hard month that last year when I saw Lynne, Jo and Karen had arranged their first Thread House retreat at the end of January at Folly Farm near Bristol, I knew I had to go. I am so glad I did. It was a wonderful weekend, just what many people needed and even after a rainy drive home on Sunday, I felt relaxed and revitalised. The rural location kept everyone together. Groups couldn't go off for separate meals or meetings so it gave the experience more of a shared feeling. I talked to as many people as I could, there were so many opportunities to do so. Mealtimes were generally sit-down rather than buffet and there were plenty of tables. I ate with different people for breakfast, lunch and evening meal. The food was excellent. I booked as a vegan was I no longer eat dairy and all requirements were met and more. The chef was very helpful and I felt wonderfully catered for. The meals were of a high quality, generous portions and we never felt hungry! Even at morning break times, there was always plenty of cups, coffee and tea as well as being trays of cakes and shortbread. In cold weather especially, this was much appreciated. I never touched the tea making facilities in my bedroom as I didn't need to. There was an honesty bar, no one had to leave to go to the pub, again keeping everyone together. Everyone shared a bedroom. Some were two to a room, some were multiple people sharing and this included bunkbeds. I think this lead to a more community feel. To be honest, most people, myself included, usually look for a single room but this wasn't an option so we all got on with it. I only went in my room to sleep after long busy days. I shared with Nicky and she was a great room mate! Lynne, Jo and Karen are experienced teachers and it showed. They had a clear idea of what they were doing, were well resourced and prepared and were generous with their time and skills in lessons and beyond. As well as teaching, Lynne, Jo and Karen put the time in socially. They talked to everyone, moving round the various communal evening spaces and shared of themselves generously throughout the day. The design of the centre means that the communal spaces are generally in easy sight by or close to the entrances to buildings so it's easy to include everyone. It also makes it easy to remove yourself from a busy room and have a quite 5 minutes on a sofa without feeling anti social. The goodie bags were amazing (see pic above), so much fabric! I don't think this is critical to a good retreat but as it's the first thing you receive once you arrive, it puts everyone in a happy mood and provides resources for classes in case you forget anything. The sponsors were very generous. There were the usual name badge/zip pouch swaps. I arrived late as I had to travel after work so I didn't do the name badge but I received a quilted personalised Liberty pouch from Poonam, the first time she had made a zip pouch! A lovely memory of the event. 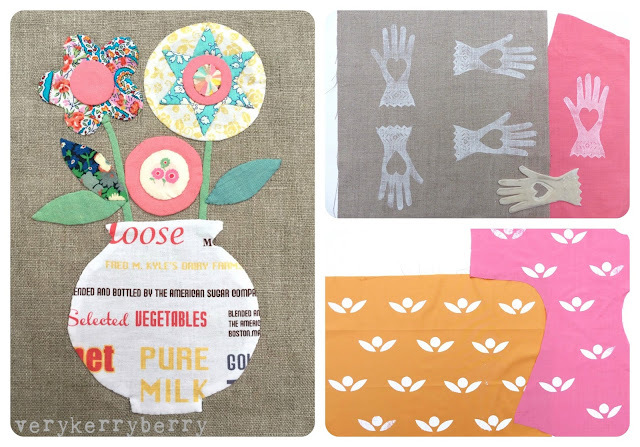 I did three classes in all: two printing sessions with Karen and some appliqué with Jo. I've done bits of printing before but no screen printing and Karen had us all quickly constructing mini hoop frames and blanking out gauze. I can safely say that screen printing is not really my strongest crafty talent, I find it extremely difficult to keep my fingers clean of paint for a clean print and just as hard to squeeze the paint where I do want it to go through the mesh. 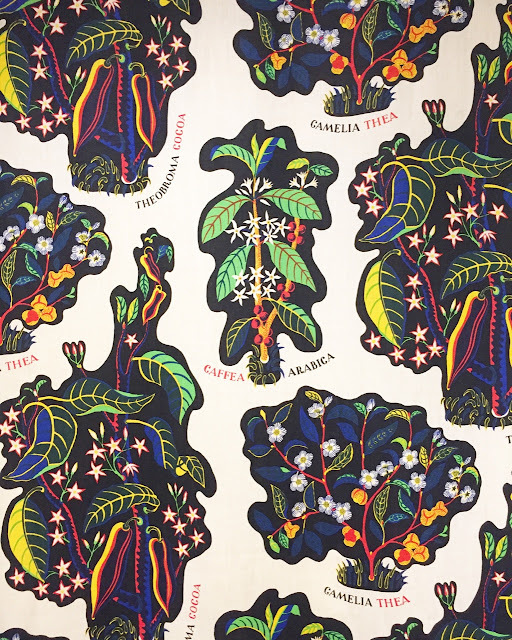 I did enjoy watching others who took to it fast, swiftly printing up fat quarters of fabric with their motifs. Lino cutting was easier - I did quite a lot of it at primary school and the memory of it came back to me during the process. The applique was fun, there's always something new to learn and I came away with some tips and tricks. Anna from Eternal Maker drove from Chichester to Bristol to set up a packed stall of goodies on Saturday in the area near the dining room so where everyone passes several times a day. As always, there was a plethora of goodies including bag hardware and integrating - stuff that many sewers find hard to source locally - as well beautiful fabric like these Heather Ross lawns and a quirky cacti cotton. These are mainly goodies that I had already lined up from@eternalmaker_destash account, plus one FQ of the new Carolyn Friedlander 'Friedlander' range which looks like her best ever and more of it, including lawns, is still to arrive. The village style fabric is for a spring skirt. In all, a restorative experience. I'm hoping it becomes an annual event.